Adding a home bar is a great idea for those that like to host social events. They provide you with a central gathering place where you can serve your guests beverages, hone your mixology skills, and even just simply unwind. However, a well-furnished bar is just as important as a functional one. And, while it may seem the most important thing for the bar to be stocked with is your favorite refreshments and liqueurs, it’s equally important it be stocked with tasteful decorative accents. A tea trolley sounds like a ludicrous thing to have in a bar, but it’s essentially the equivalent to a bar cart. This is where you can keep your favorite bottles. It’s a beautiful touch that should be artfully decorated. When topped with a beautiful serving tray and crystal or glass decanter set, it could easily become the pièce de résistance of your home bar. 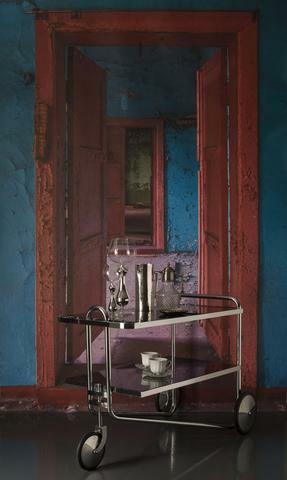 The Alvar Aato Tea Trolley makes a stunning modern contemporary bar cart, while the Marcel Breuer B54 Cart (pictured above) is a more traditional, rustic choice. The secluded nature of the bar cabinet is what makes it a perfect place for your most exclusive, and expensive, bottles. On the outside, it appears to be all-business, almost taking on the appearance of a filing cabinet. 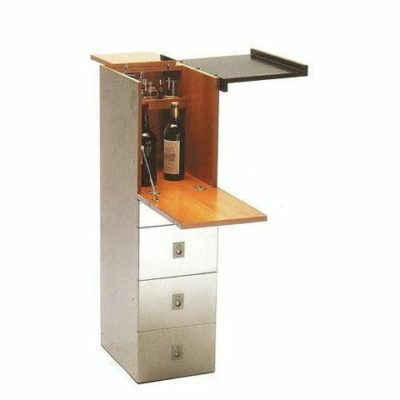 However, its top portion unfolds to reveal a small bar storage, with just enough space for 2-3 bottles and a few glasses. Watch your guests’ eyes light up as you unfold this beautiful piece of modern contemporary furniture to reveal your top secret collection. Bauhaus2YourHouse carries two bar cabinets, both of which are by Tecta. The S55 Bar Cabinet has a maple veneer bar partition, while the similar Standing Desk Bar Cabinet has a cherry wood partition. Perhaps you feel like having a fine cigar with your snifter of brandy. For this reason, a beautiful ash tray may be a lovely addition – for a decorative touch as much as a functional one. 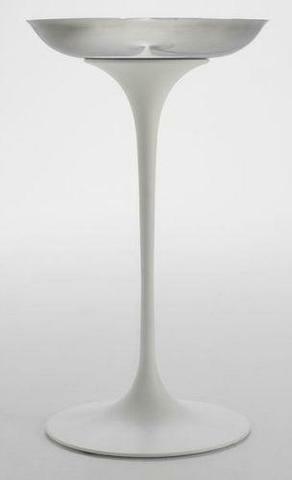 Mimicking the design of his renowned tulip tables, the Eero Saarinen Ashtray also features a tulip base. This standing ashtray, built like a pedestal, is a modern contemporary marvel. The base is cast aluminum, coated in a glossy white. The tray is satin stainless steel. This piece screams sophistication. No matter what the overall style of your home bar, a nice blend of traditional and modern accents will make it a focal point for parties, gatherings, and all kinds of social events.